This is just a quick post before I have to leave for the Great Barrier Reef! I might actually be a bit late for week 9 next week, as I’ll only be back on Wednesday very late. Without further due, here it is! Week 8 was adding 2 rows for the border. I actually really like how the colours from last week come through the first row and the crosses look very cool on the second row. Have a great weekend everyone and I’ll be back on Thursday! It is almost October already, which means another birthday! This one is for my friend who’s fan of Pokemon. 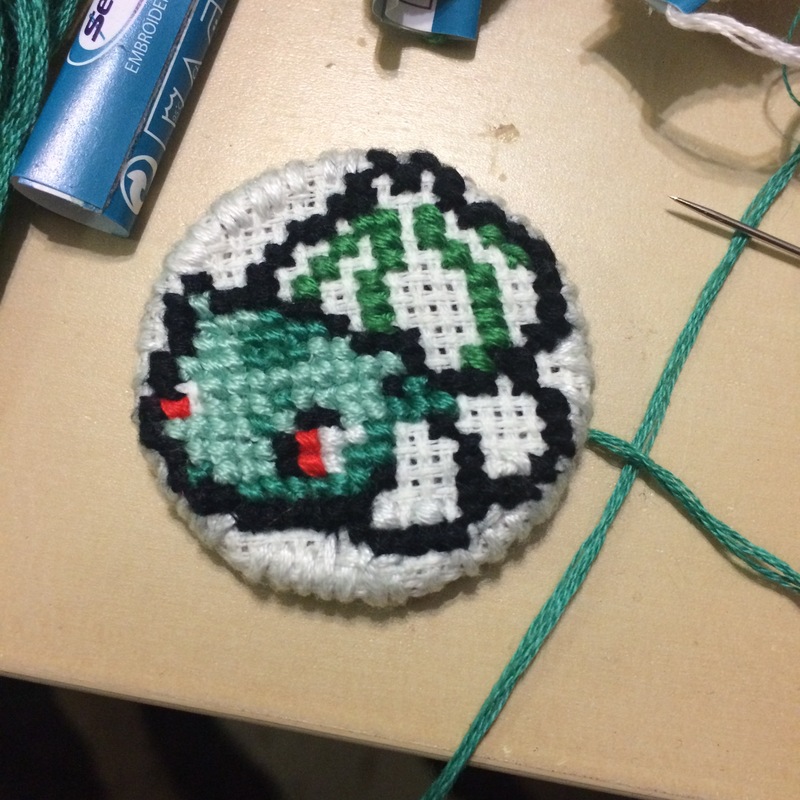 So I’m making her a cross stitch pendant of her fav Pokemon! So first I looked for a good pattern on Pinterest and I found one that was small enough to put on a necklace. Then I had to find an actual ring on which to put my canvas. I was looking for one of those tiny wooden canvas holders but I was out of luck and only found metal rings. So I ended up just sawing my piece of canvas on the ring with white thread. I’m surprised how well it worked! I really like the look of it, so now I might have to do a few for myself! 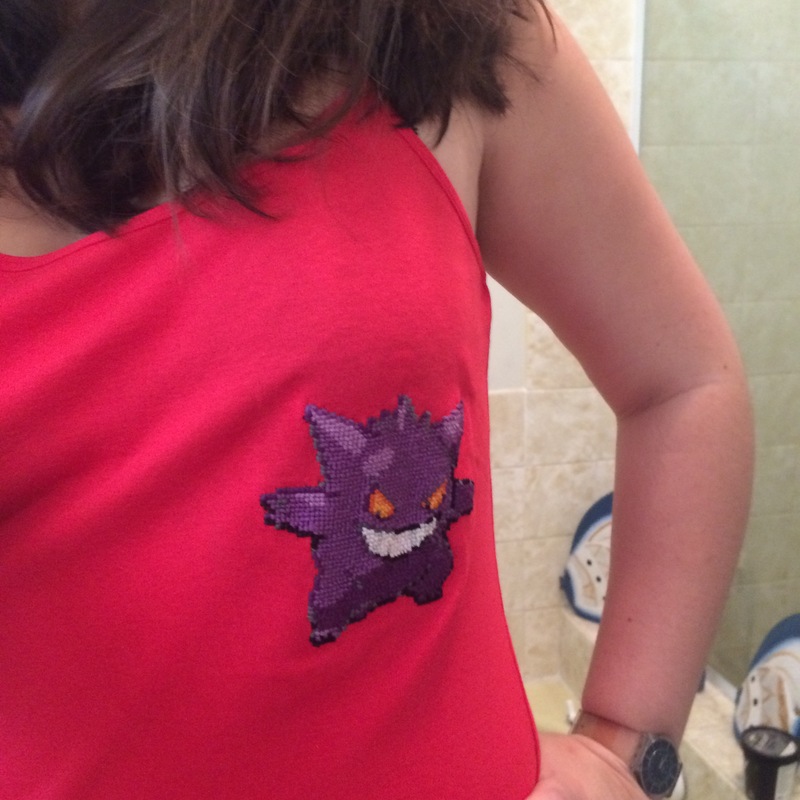 Maybe I’ll go for Ghasly, to go with my Gengar shirt. Do you have a signature birthday present that you like to make for you friends and family? Yay today is my birthday! We had a bit of a celebration yesterday is was so nice to meet up with my friends and in laws and have a relaxing time! 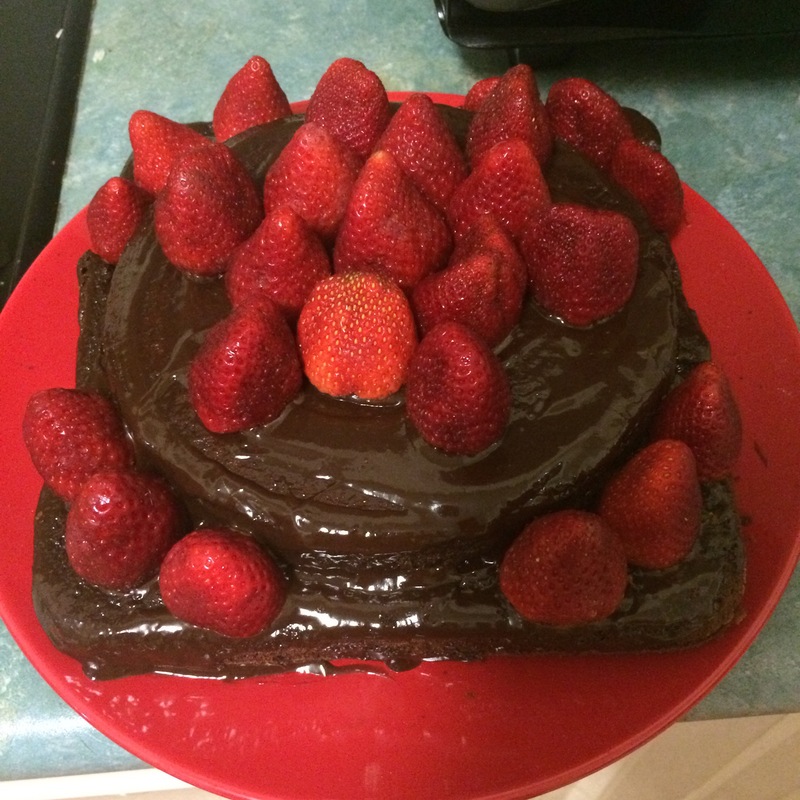 I made a cake for the occasion, it was so simple but very yummy! 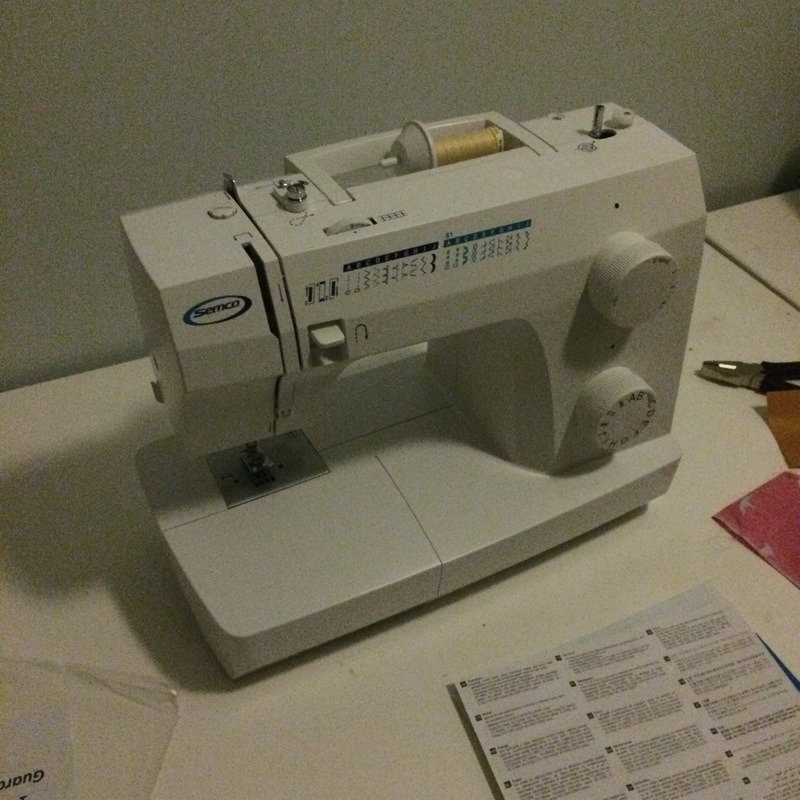 I also got an amazing birthday present from my loving half: a sewing machine! 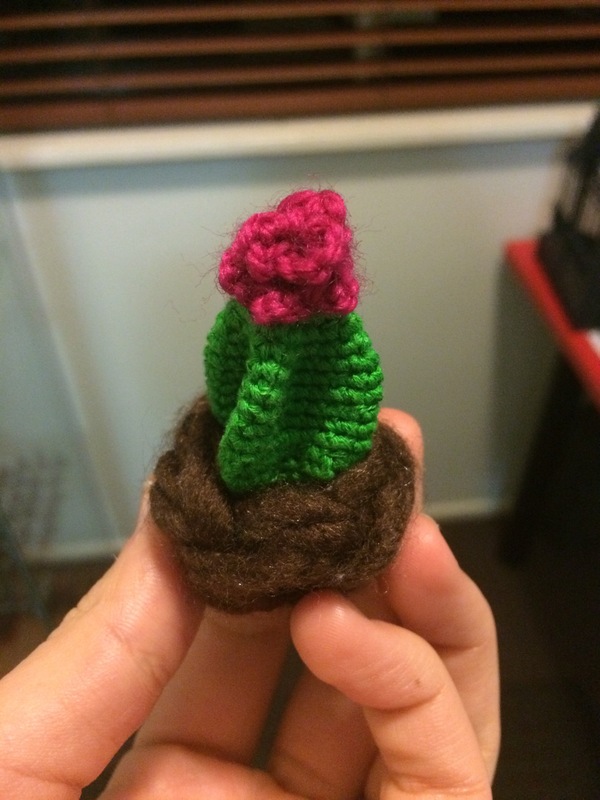 I just couldn’t wait to try it and I found a very easy beginner pattern on mathastewart.com for a pin cushion, so here it is! 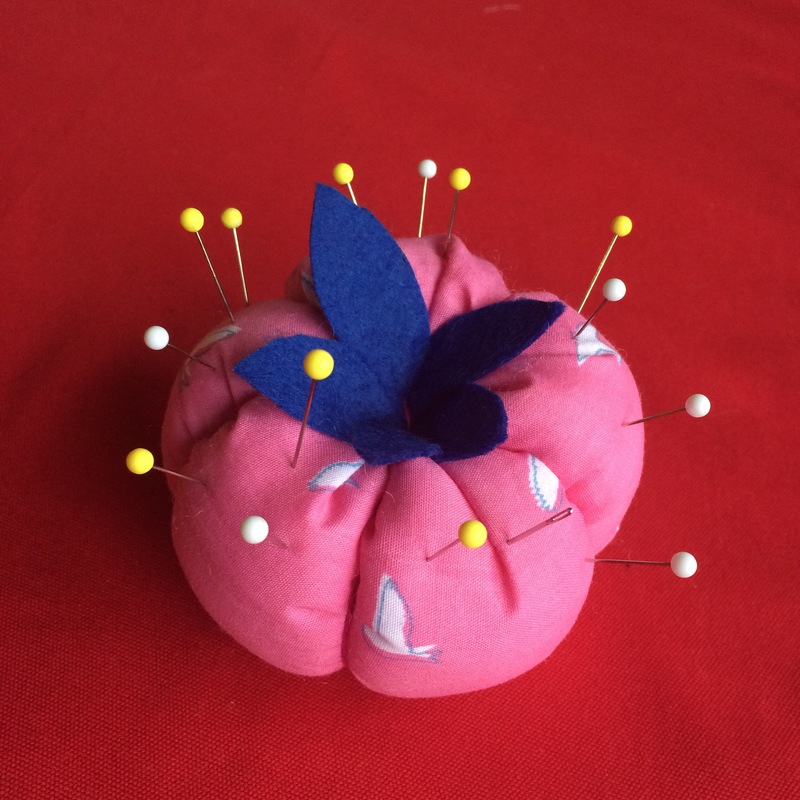 tomato shaped pin cushion – cute and useful! You guys have a wonderful week! 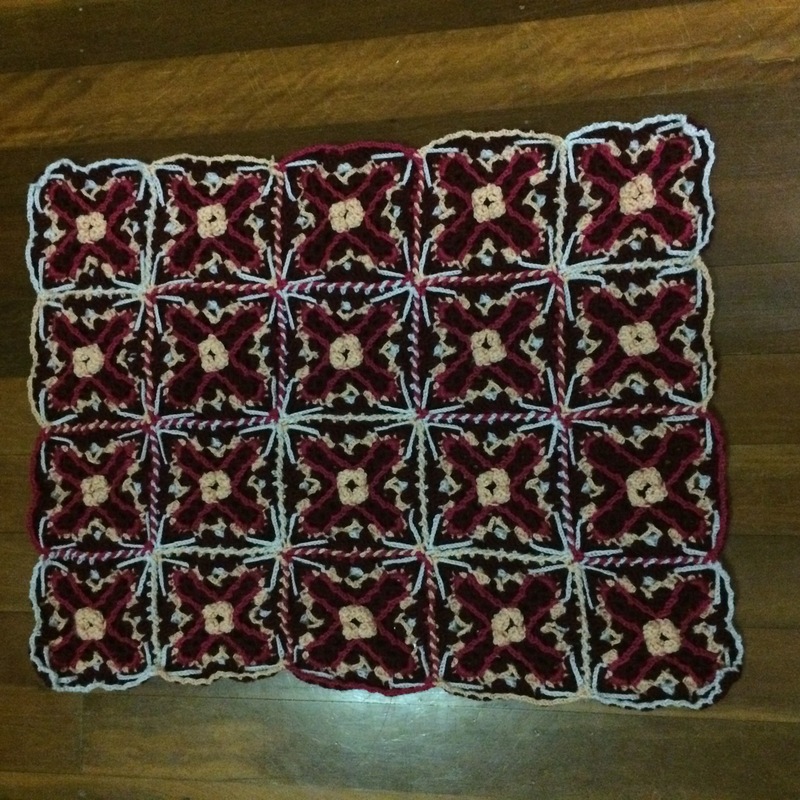 The initial 20 squares have been put together but I haven’t finished adding the extra 5. I really like this binding method it looks very good! Today I’m working from home on my computer and that’s great because the weather is really bad! I realised that it is already Thursday and I haven’t posted anything this week, how rude of me! I’ve been crazy busy with my PhD confirmation coming up, and preparing for my trip up the Great Barrier. 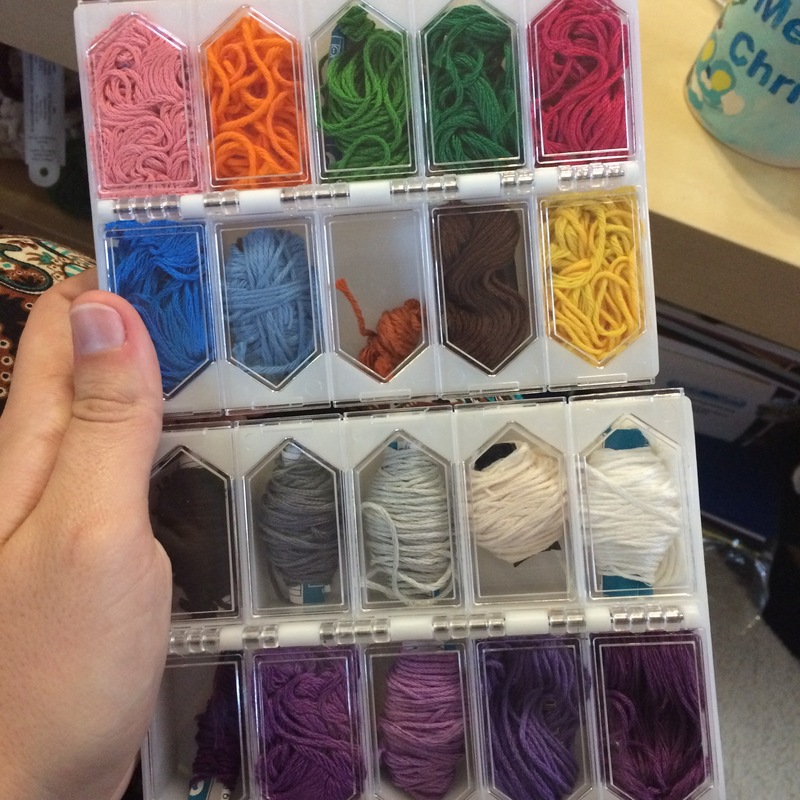 I got some great new containers to organise my threads for embroidery and cross stitching, $2.8 at Daiso (it’s a very cool Japanese shop, where most stuff costs $2.8!). 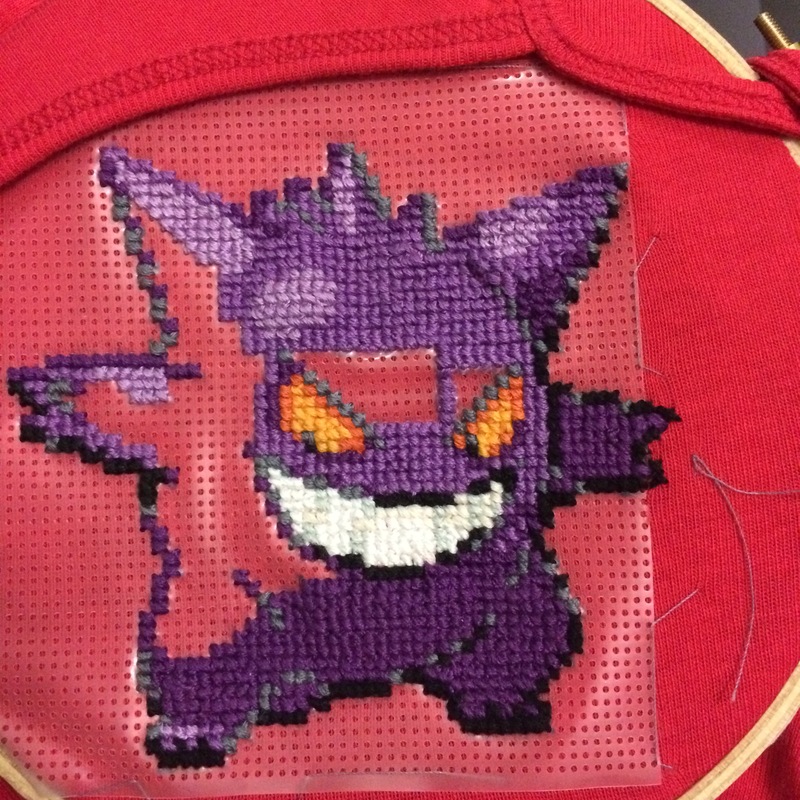 I also made huge progress on Gengar, he should be finished soon 🙂 I’m a bit worried about removing the grid, I hope the shirt turns out good. And I finally got more yarn to continue my picnic throw, I’ve got 2 squares not (going for 4 total). Do you think I should add a border and if yes what kind of border would you suggest? TGIF! 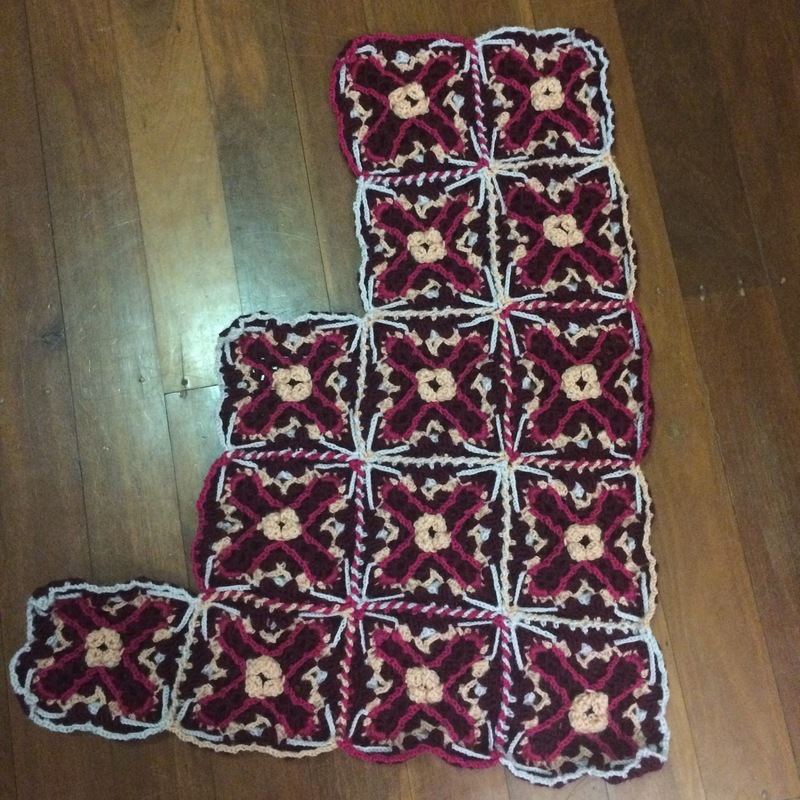 After a pretty rough start to my day (twisted my ankle and fell – I’m so clumsy…) it is time to share my CAL progress with you lovelies! 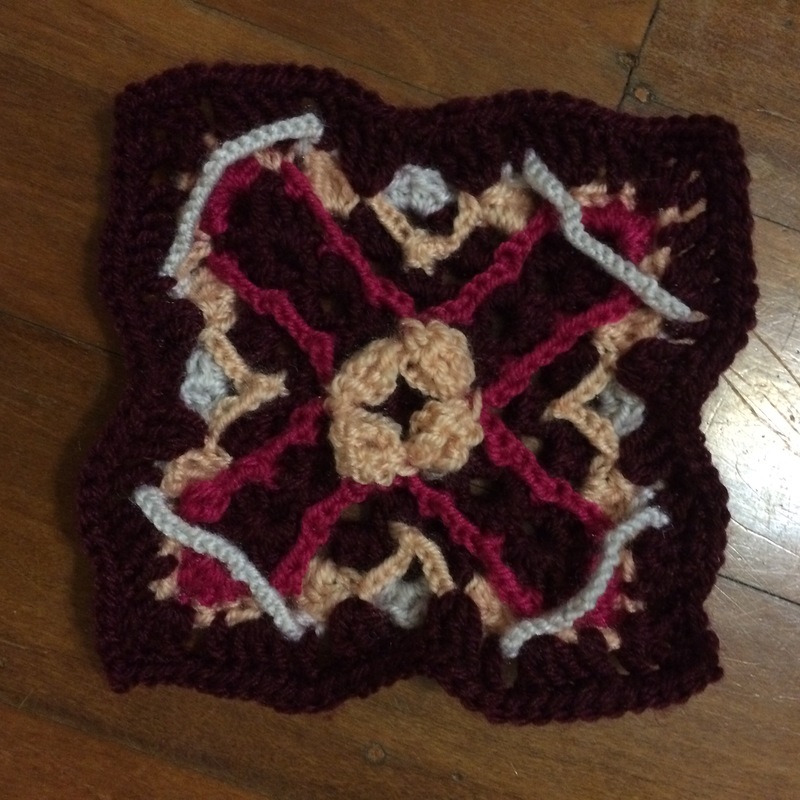 This week and next week, we have to join the granny squares together using the twisted braid technique! It sounds complicated but it is really simple and fast! 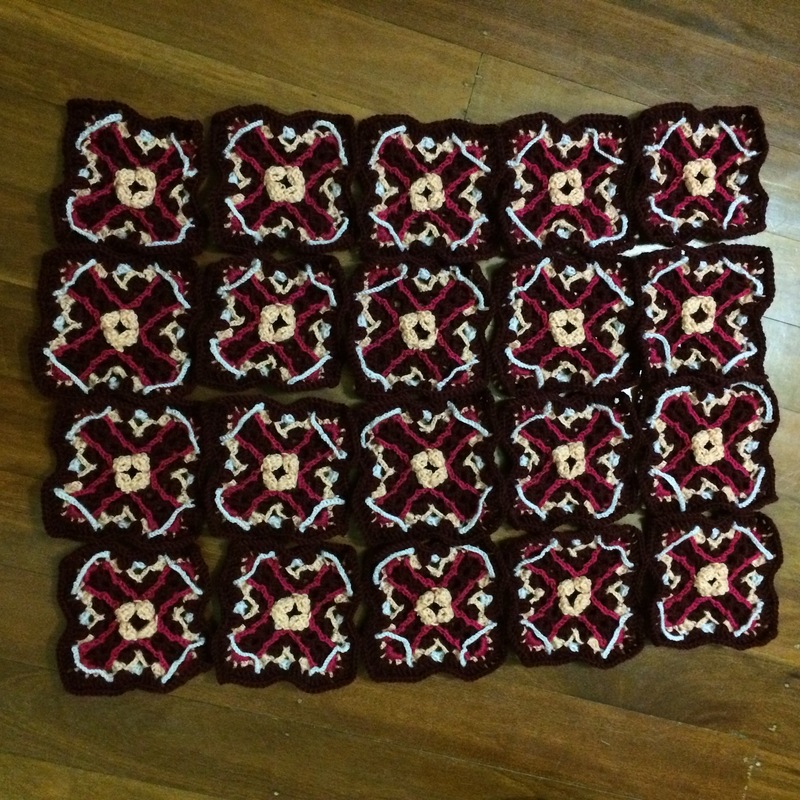 I’ve almost finished joining all my squares and I still have a whole week! 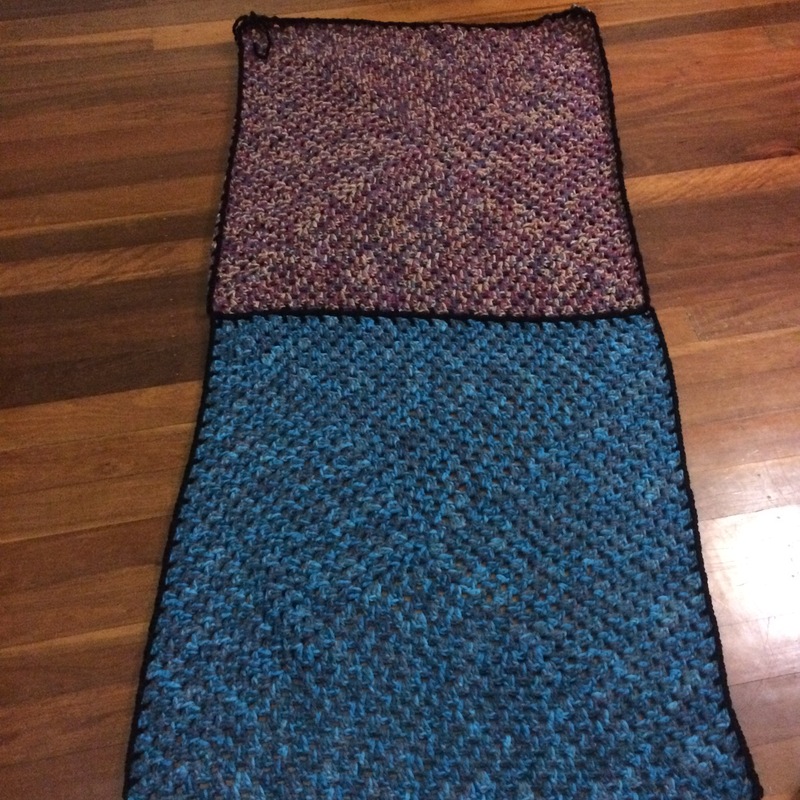 The thing though is that I think the blanket is pretty small so I’m going to add a few rows (probably 10 squares). 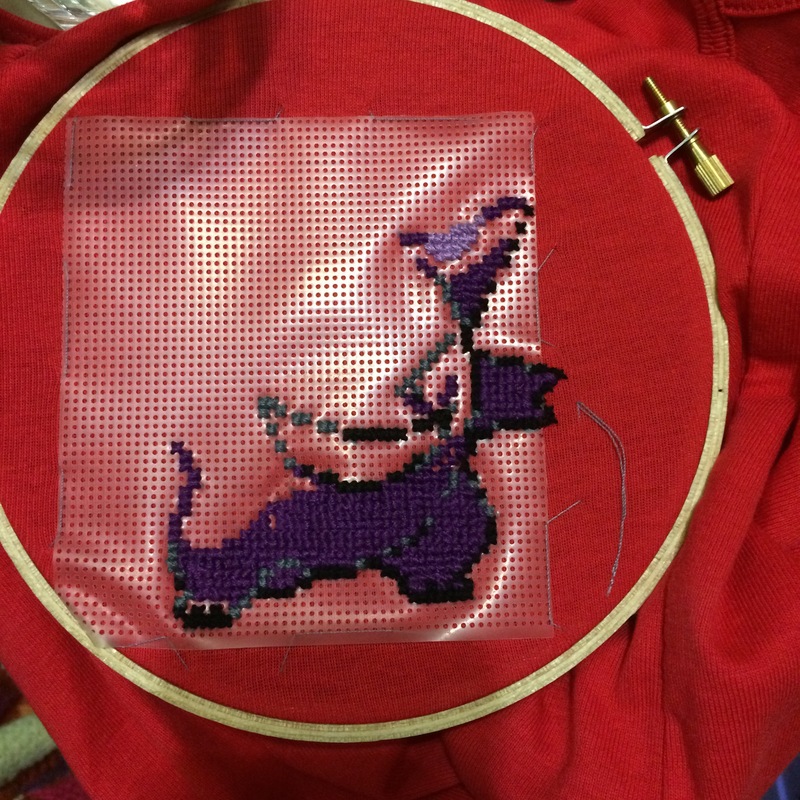 I’ve also made a lot of progress on my cross stitch since yesterday, a few hours in front of the TV apparently works great with me and cross stitch! Hope you guys had a wonderful week! What a week! Is it just me or is time just going too fast? 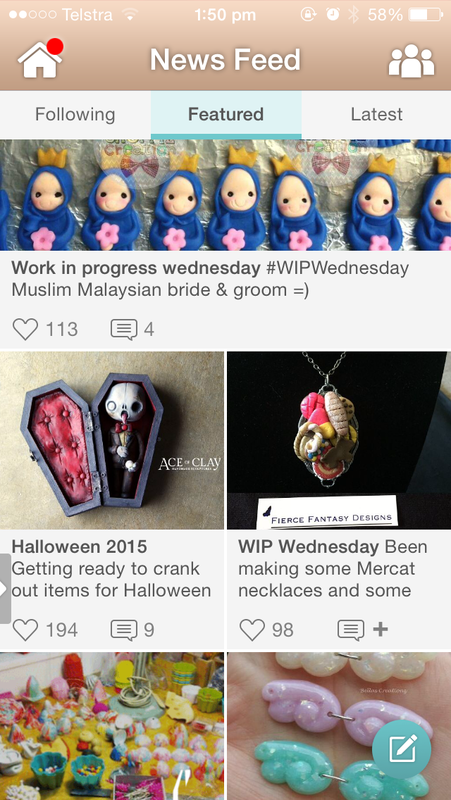 This week I’ve given a go to polymer clay, because I’ve been really inspired by all the amazing work showcased on the app “Crafty amino”. It’s an app for all crafts, there are a few very good fellow yarn addicts but most of it is clay. Although a lot of people on there seem to be pretty young and there are a few of completely unrelated posts, admins are doing a good job with their “featured” page and there are some really talented crafters out there. 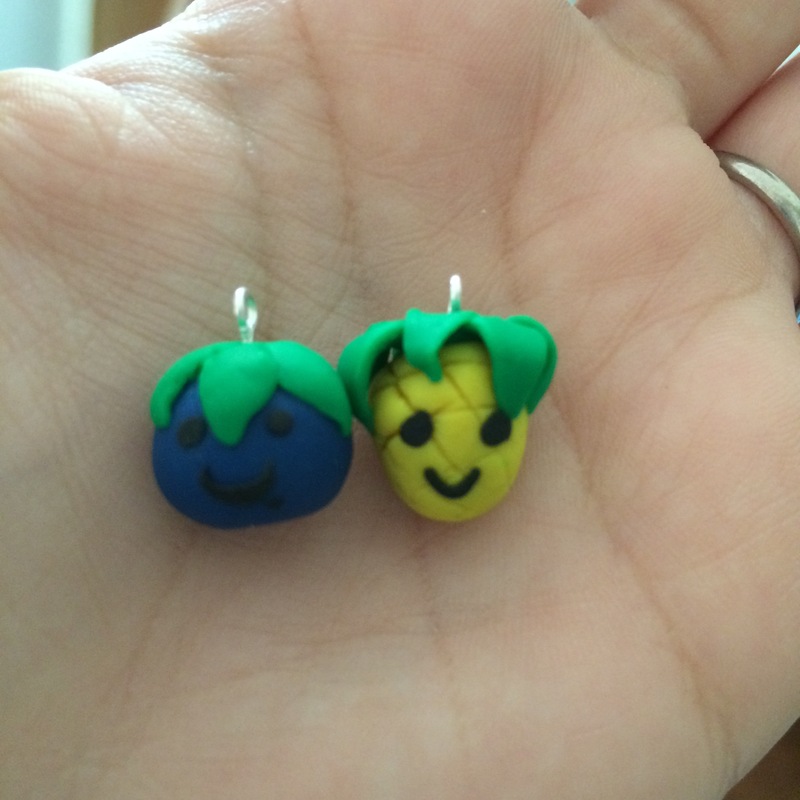 So here it goes, I made little fruity charms out of stretchy clay (not the best but I already had some at home). They make me think a little of “Cloudy with a chance of meatballs”. 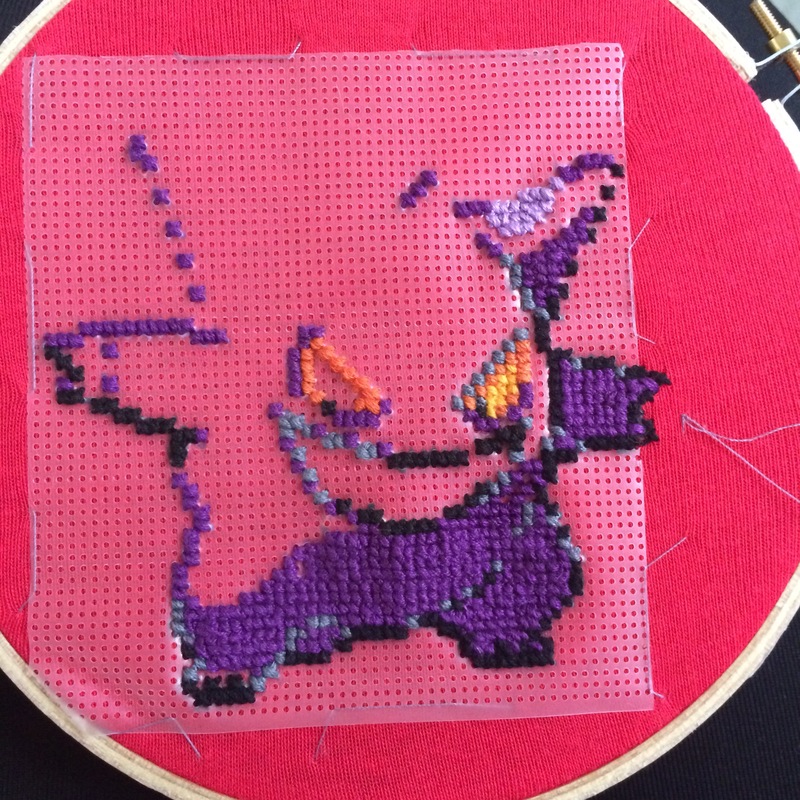 I’ve also made some good progress on my Gengar cross stitch, I find it very relaxing at night in front of the TV! What cool projects have you been working on this week? 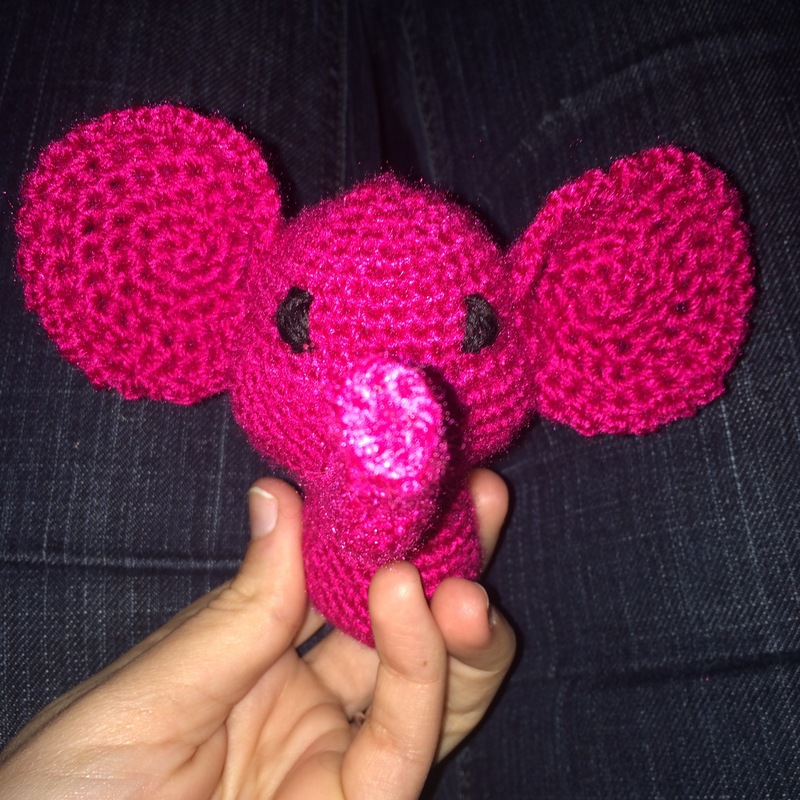 Eddy the elephant is finished, now I just need to wrap him up into a lovely box and he will be ready to go to his new home! Eddy will soon be in his new home! 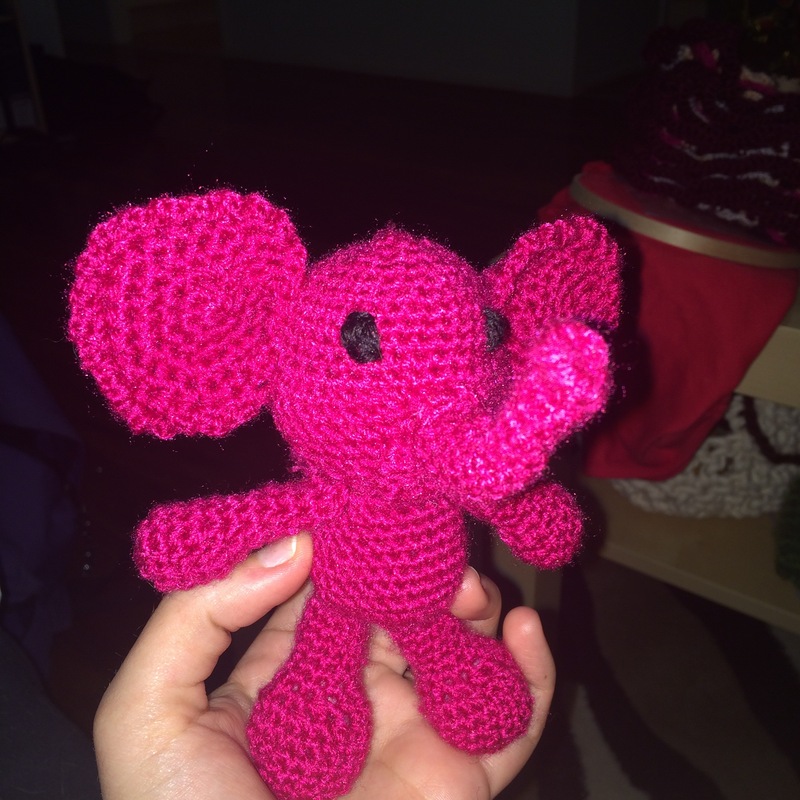 The pattern I used is from the awesome website AmigurumiToGo, go check it out, there are heaps of adorable amigurumi patterns for free on it. Also, I got some resin last week to finish my volcano (going to do the lava with resin). 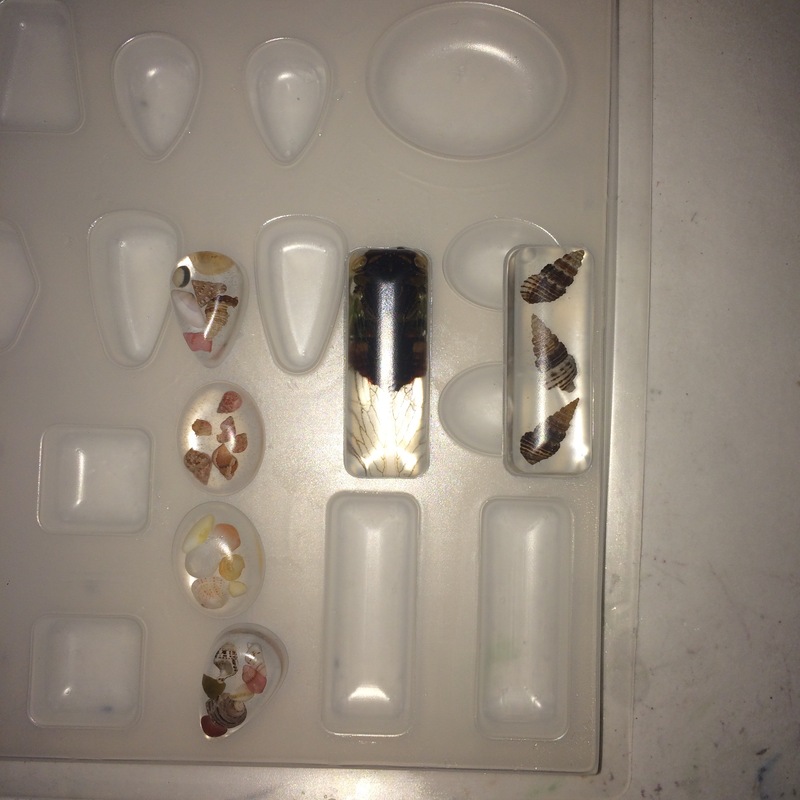 I wanted to get a feel of the resin (epoxy) before doing the lava though, so I made some resin charms using a cicada and shells I picked up. I think it turned out pretty well for a first, I’ll probably attach little metal rings at the back to make pendants out of them. Hello awesome people and happy Friday! 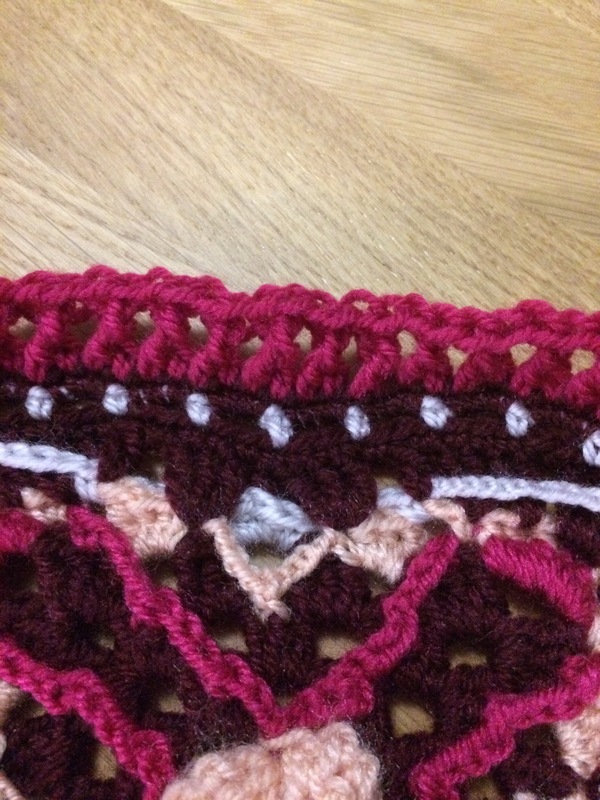 I am finally at yes half way point for this CAL, and this week’s step was very easy which is good because I really needed to get started with some birthday gifts. 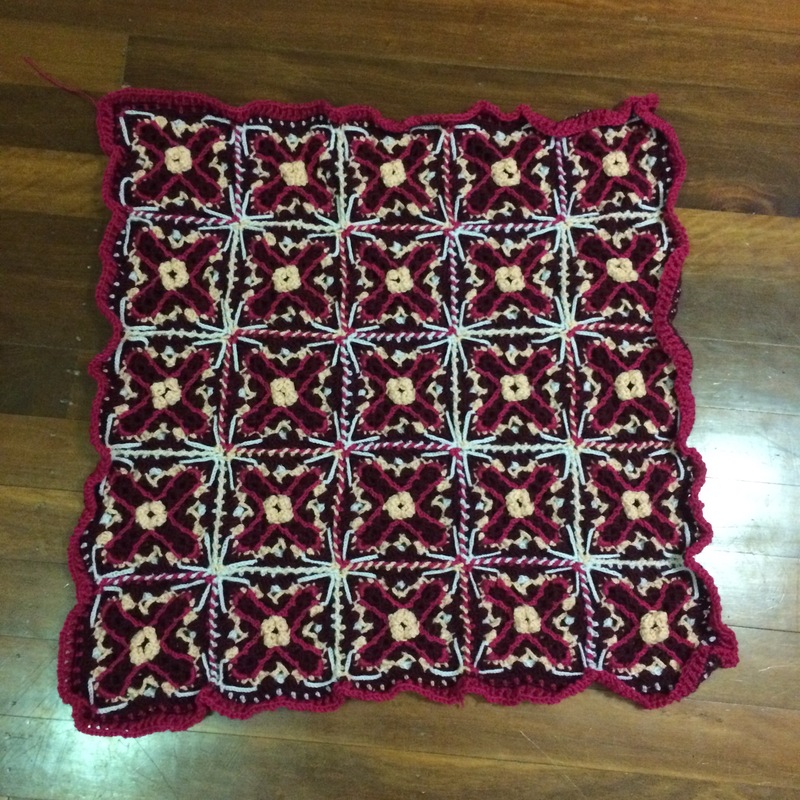 The step was to add a centre piece on each of the squares. 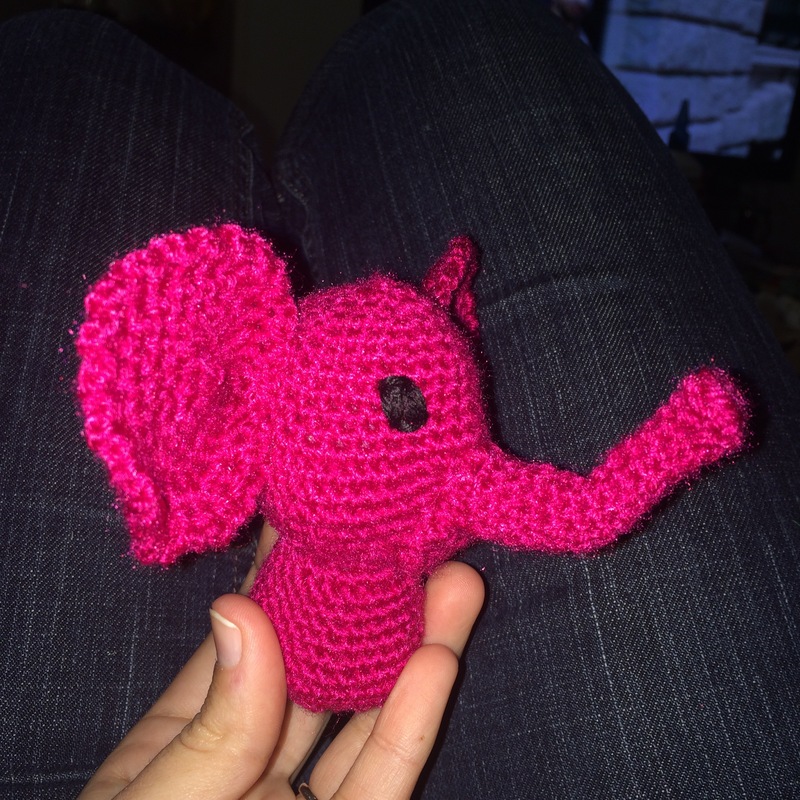 I’ve also finished the little cactus for my friend 🌵 (I just added a pink flower on top) and got started with a pink elephant amigurumi 🐘 for another birthday in September (in 2 weeks actually). I hope you guys had a wonderful week!